Zombie survival games are a dime a dozen these days. You know it’s a slow release week when there isn’t some sort of game set in a zombie filled apocalypse world. Although one would think that the zombie subgenre would have faded, and to some extent I think it has in the pop culture setting, it surely hasn’t slowed down the pace of these types of games coming to the Switch. As a result many of them come and go without much fanfare. Well, get ready! Blood Waves is here to shake things up (not really). This arena shooter fails to capture anything original or exciting, relegating it to another also-ran zombie game that we’ve all seen and played before. The game is set in a tomb-like arena where you must shoot your way through multiple waves of zombies. There’s no real story behind why you’re there or what you’re after, but since this is an action game there really doesn’t need to be. The game is meant for those with a trigger-happy disposition and a love for gore, and to its credit, the game delivers on that promise. The controls are simple: you just run with the left analog stick, fire with the right trigger and reload with the same button. The zombies have a set amount of health so to kill them you’ll need to keep firing away until they’re chunks of dead flesh. Aim for the head to do more damage or shoot their limbs off for good measure. After you complete each wave, a secret cave will open up in the arena leading to a shop. Here you can use the money you collected from the dead zombies (as one does) to buy new weapons, ammo, and traps. There are a variety of guns to unlock, ranging from a simple handgun to a rocket launcher. While there are plenty of weapons to use, the ammunition is very limited so thankfully you have a machete to use as backup. Traps like spiked fences and a flamethrower will help you save on ammunition. You can even build a pillar made out of chainsaws to chop up the enemies! If you successfully complete a wave of enemies you will gain upgrade points that can be used to enhance your weapons or imbue your character with better skills, like faster agility or increased melee damage. While the options for weapons and traps are plentiful, the amount of money you get isn’t. From the very first wave, you’ll discover just how much of a grind fest this game can be. You earn very little money compared to the price of weapons and traps, and that’s not including the price of all the ammo you’ll need for them. On top of that, traps and barricades can be damaged or destroyed by zombies. So you’ll have to also earn money to either repair your traps or just replace them due to them being destroyed. Normally I wouldn’t mind this sort of inventory management and strategy, but the game ramps up in difficulty so quickly that it becomes more of a chore in frustration. Later waves you run out of stuff so fast that you’ll have to rely solely on your machete, which is the least fun thing in the game. Normally I love challenging games, but only if the game makes overcoming the challenge satisfying. Overcoming near impossible waves of zombies just to receive barely enough money to buy back the ammunition you lost in the last round makes the game infuriating. And sure the game raises the amount of money you get each wave, but when you have to pay for so much stuff it just becomes a tedious grind fest. All of this could easily have fixed if the game would allow you to carry over your progress into another round, but that’s not the case. The game is made even more difficult by the stingy awarding of upgrade points (one per wave). Most upgrades take at least two or more points, which means the cost of entry to a better character is simply too high. It’s almost like the developers made a fun game and then added in all of these barriers to make it more difficult to the point where it sucked all of the enjoyment out of the end product. While the game is all right for what it is, it’s a real disappointment that there aren’t any other game modes to play. The standard game mode is fine enough, there’s nothing wrong with having some variety in your game. A game like this just begs for a co-op mode of some kind, but sadly you’re not going to find one here. There’s also the lack of environments, with you just being stuck in the same tomb-like area every game. The game’s soundtrack is also severely limited, which doesn’t help the replayability of a game that only has one environment to play in. Despite this, they did at least add some variety to the zombie lineup with some having unique attacks like vomit, electricity, and explosives. The underlying ideas of a good game are here, but the execution falls well short of creating a fun time. 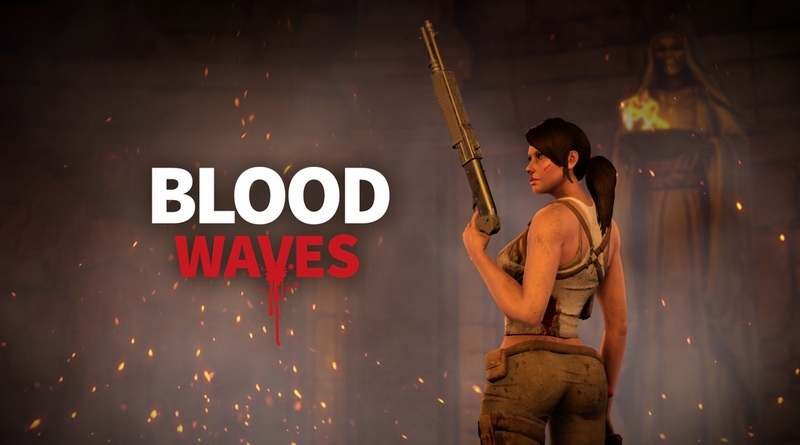 Blood Waves could have spent more time in the oven to polish up the flow of the game and to make it more approachable. Little things, like choppy animations, having to reload your weapon immediately after changing to another, and stingy rewards make this one easy to pass on. Blood Waves might satisfy some zombie aficionados, but most gamers have seen and played better games in this genre. The lack of polish, tedious grinding, and high difficulty make this game an easy one to pass up. For the $10 price it’s not horrible, but with so many other great games near the same price point, it’s hard to recommend this one.